We're warming up to go back to the House of Jazz on Monday (27). come down to sit in with us. Sylvia Harris sent me this video. 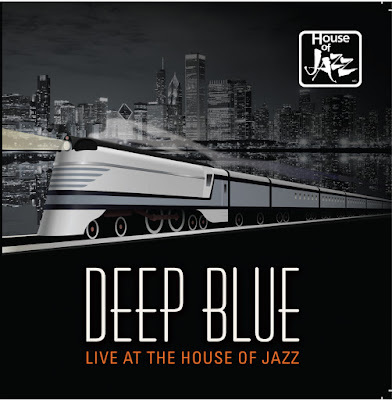 Deep Blue and Sylvia, "Little Red Rooster"
in Chicago and listening to the great Howlin' Wolf sing this live. One of the books I've been reading lately is "The Jazz Standards: A Guide to the Repertoire" by Ted Gioia. This comes Amazon.com's description of the book. "Many books recommend jazz CDs or discuss musicians and styles, but this is the first to tell the story of the songs themselves. The fan who wants to know more about a jazz song heard at the club or on the radio will find this book indispensable. Musicians who play these songs night after night now have a handy guide, outlining their history and significance and telling how they have been performed by different generations of jazz artists. Students learning about jazz standards now have a complete reference work for all of these cornerstones of the repertoire." the playing of these songs a new perspective and a new depth. I recommend the book to players and listeners. taking her place as featured vocalist, the band took rock solid form. The House of Jazz was full on Friday and we took the stage after Taurey's group finished. The show was initially assembled by Doudou Boicel as a tribute to Big Mama Thorton, so we did quite a few tunes recorded by Big Mama. The band did "Watermelon Man" a Herbie Handcock tune that was also, strangely enough, recorded by Big Mama. Jeff Simons did a great job on drums and took the band to a new level. Jeff fit in as though he'd been in the band since the start. Peter Mika was on fire on piano and Gary and Jeff were rock solid. Every time Sylvia sings with us her performance gets better and better. A television producer from Ireland was in the house and filmed part of the show. He edited the video and we've got a great video of "Work Song" that we'll be posting soon.